Note: this is not an efficient way to fill in the matrix. This is an unsupervised document clustering / topic extraction. We have no previous knowledge on the number of topics there are in every corpus of documents. 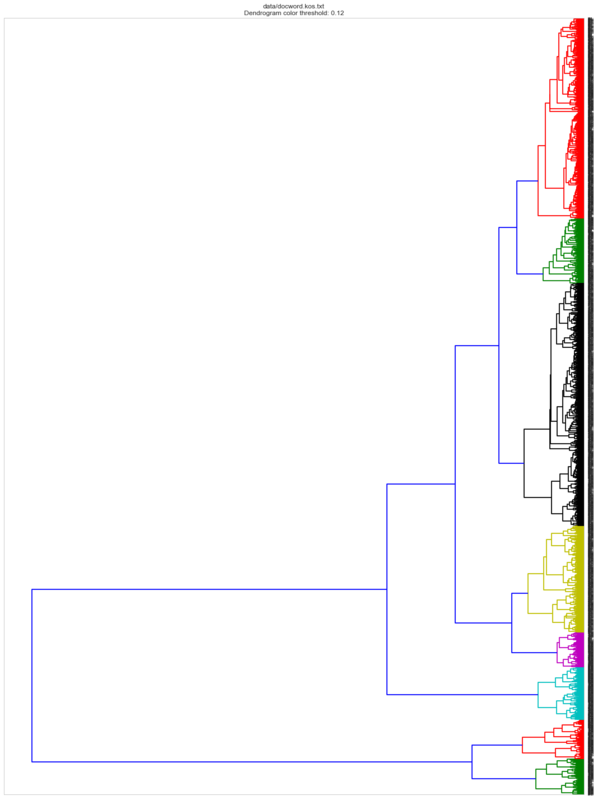 Another option to estimate an initial number of clusters consists of running a hierachical clustering and plot a dendrogram. Depending on the method and metric different results can be achieved. If a good candidate for k is found K-Means can be re-run using it as input. In addition, several K-Means runs are advised since the algorithm might end up in a local optima. TruncatedSVD implements a variant of singular value decomposition (SVD) that only computes the k largest singular values, where k is a user-specified parameter. When truncated SVD is applied to term-document matrices (as returned by CountVectorizer or TfidfVectorizer), this transformation is known as latent semantic analysis (LSA), because it transforms such matrices to a “semantic” space of low dimensionality. In particular, LSA is known to combat the effects of synonymy and polysemy (both of which roughly mean there are multiple meanings per word), which cause term-document matrices to be overly sparse and exhibit poor similarity under measures such as cosine similarity. TruncatedSVD transformer accepts scipy.sparse matrices without the need to densify them, as densifying may fill up memory even for medium-sized document collections. The appropriate value of s is a matter of debate, and is application-dependent. Smaller values of s represent a greater extent of dimensionality reduction at the cost of a loss of structure of the original DTM. Values anywhere from 30 to 300 are commonly used. The first step assigns each sample to its nearest centroid. This takes forever without dim red. Use DTM_tfidf_lsa instead of DTM_tfidf Note also that DTM_tfdif_lsa, unlike DTM_tfidf, is not sparse anymore. No need to convert to dense format! Silhouette Coefficients range between [-1,1]. Values near +1 indicate that the sample is far away from the neighboring clusters. 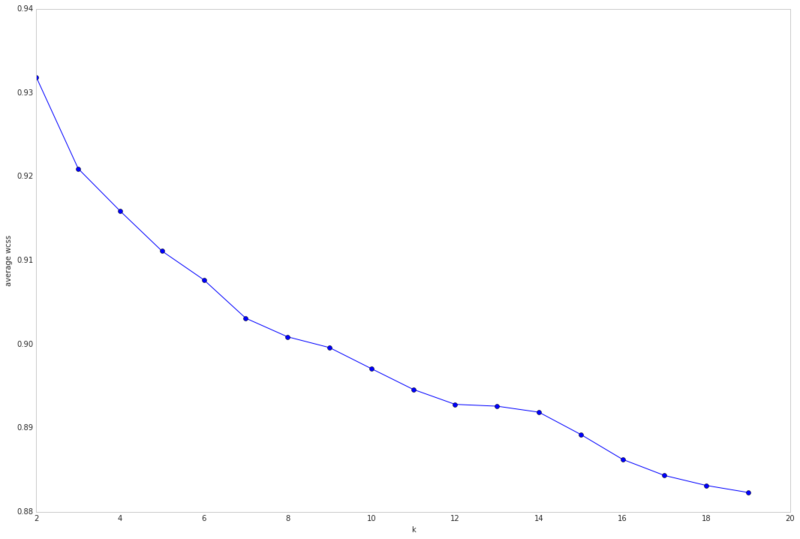 A value of 0 indicates that the sample is on or very close to the decision boundary between two neighboring clusters and negative values indicate that those samples might have been assigned to the wrong cluster. 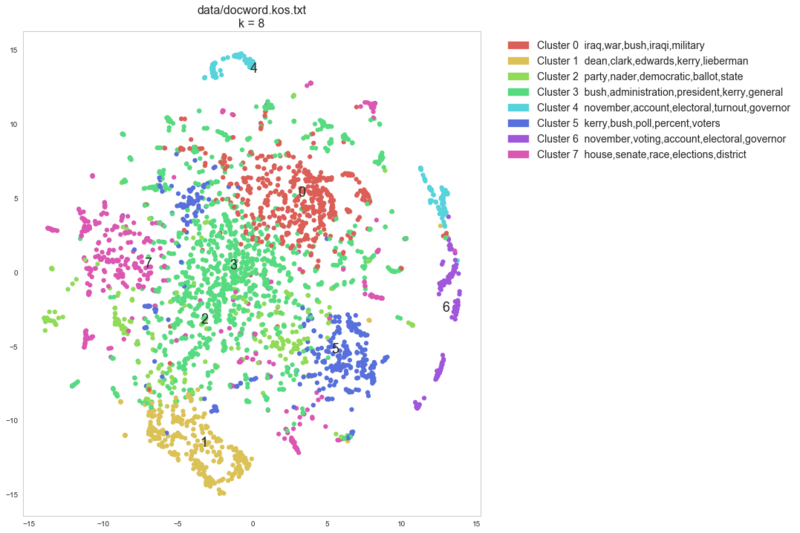 t-SNE is a machine learning technique for dimensionality reduction that helps you to identify relevant patterns. The main advantage of t-SNE is the ability to preserve local structure. This means, roughly, that points which are close to one another in the high-dimensional data set will tend to be close to one another in the chart. t-SNE also produces beautiful looking visualizations. palette = np.array(sb.color_palette("hls", n_labels )) # color palette with seaborn.